Jane is an 11-year-old girl who enjoys playing with Beanie Babies and Barbie dolls. 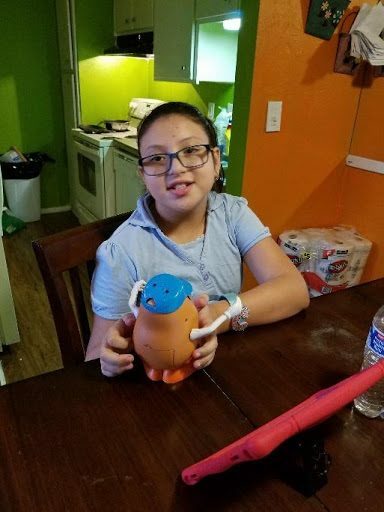 Her parents referred Jane for speech therapy due to concerns about her difficulties with speaking clearly and completing given tasks such as daily chores without repeated reminders. Jane’s overall speech intelligibility was notably compromised and was comprehensive to listeners about 50% of the time, especially if the subject of the conversation was unfamiliar to her. She required verbal reminders 100% of the time, even when a single task was given. During the initial speech and language evaluation, the evaluating therapist, Makiko Ogawa, learned that Jane was receiving speech therapy services in a special education classroom at school due to having been diagnosed with intellectual disability. 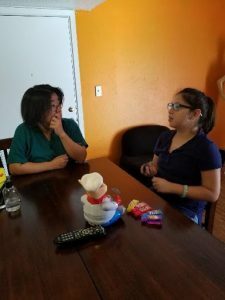 After standardized tests for articulation and language were administered, Makiko gathered additional data and information from Jane and her parents to develop the most appropriate treatment plan. Considering the evaluation results and Jane’s unique learning styles, therapy goals were set in order to maximize Jane’s cognitive-communicative functions, instead of working on specific articulation or language skills. Once therapy began, Jane and Makiko discussed what makes a person’s speech intelligible or unintelligible, and t hey demonstrated intelligible vs. non-intelligible speech. Based on the discussion and reverse demonstrations of the patient’s speaking demeanor by her SLP, Jane chose three elements: the rate of speech, the volume of speech, and eye contact as “the things I can do better.” Those three elements were practiced repeatedly via a variety of therapy tasks and multi-modal assistance, like using a mirror and creating recordings. As for Jane’s difficulty of completing the given multiple tasks, the visual task board of “First…then…” was introduced. This is a type of low-tech, assistive communication device to indicate with picture icons what needs to be done “first” and “then”, next. The purpose, rationales, and benefits of using this task board were demonstrated and taught to Jane’s parents. In order to use the board correctly in their daily home routines, Jane’s parents were required to see how the board was used in therapy sessions. After over three months of weekly therapy services, Jane’s overall speech intelligibility has significantly improved and she is now understood by listeners over 80% of time consistently, regardless of the conversational subjects! Jane is able to assess her articulation and speaking demeanor based on the three components and self-correct them effectively with the average of one cue. Jane’s mother reported that her daughter is “now very confident, and talks a lot” with others, instead of trying to hide behind her parents’ backs. Her father has noted that Jane is now able to complete more than one task independently “about 50% of the time” once the parents have started to utilize the task board to present the needed choirs visually as well as verbally. 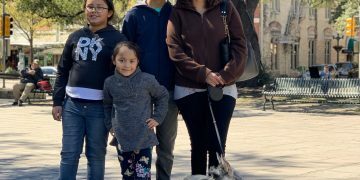 Jane is expected to be discharged from speech services this month due to her excellent progress and strong parent involvement in treatment sessions.